Here's how you can use Populi's integration with Unicheck to check student file- and essay-type assignments, test essay questions, and discussion posts/replies for plagiarism. The setup sections of this article must be performed by your school's Populi Account Administrator; after they've done that, you'll have the plagiarism-check options available for your use. First things first: you'll need to set up a Unicheck account for your school. When you do this, make sure to contact Unicheck and inform them that you're a Populi customer. They'll direct you to the appropriate account type for your school. In your Unicheck account, go to Integration > API Integration. Enter an App name (may we recommend Populi?). Note that Unicheck has pre-filled the API Key and API Secret fields—you'll need these items for the next step. In Populi, go to Account > Account Settings > Integrations. Find the Unicheck API fields (they're near the bottom of the screen). Copy the Unicheck API Key and API Secret into their respective fields. Scroll back to the top and click Save Settings. After completing these setup steps, faculty members will have the plagiarism-checking features described below. You have a few options for how you can use Unicheck with assignments. Automatically check student submissions: If you check this, all student submissions will be checked for plagiarism as soon as they are submitted. Three visibility options: You can let students see the Unicheck reports as soon as they're available, you can hide them, or you can decide on a case-by-case basis. After you Save the assignment, student submissions will be subject to the plagiarism-check settings you've established. 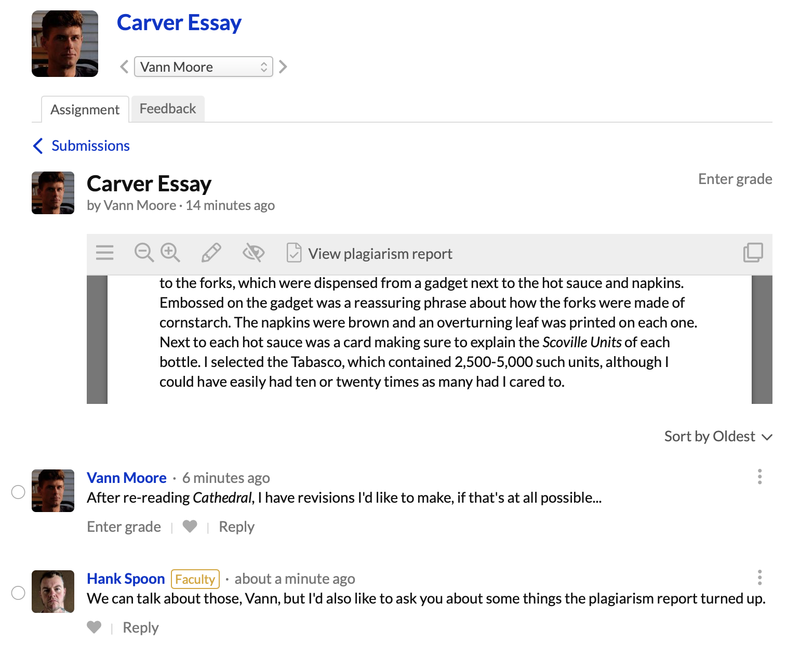 After students have submitted work, here's how you'll check it for plagiarism. Go to the assignment page. In the document viewer panel, click Check for plagiarism (it's alongside the controls at the top of the panel). You may need to wait for the plagiarism check to complete. When it's done, click View plagiarism report. If you've set up the assignment to automatically check for plagiarism, the View... link will already be there. You'll be taken to the Unicheck report. Among other things, it gives you the option to export the report to PDF. When you're done, click the X in the upper left of the viewer panel to return to the student's assignment detail. 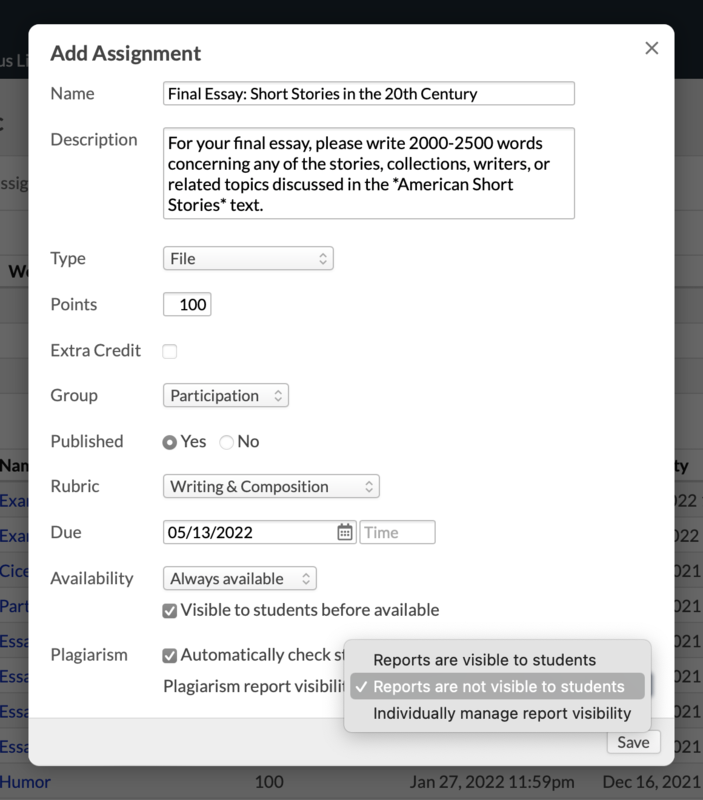 You can see the student's plagiarism score at a glance on the main assignment page. The percentage is based on Unicheck's Originality/Similarity score. Click the score to see the Unicheck report. Go to the test's page and click the History view. Click the Start Time for the student's test. Essay questions will have a Check for plagiarism link; if you've set the test assignment to automatically check for plagiarism, it will start running the check as soon as you open the student's test attempt. Go to the discussion's page. Click above the comment or reply you wish to check. Thanks for the great upgrade for checking discussion and essay answers! The Unicheck integration works very well. The cost is reasonable, too.